A full-length statue representing a Phoenician priest 115 cm tall and Tanit sign bronze buried since the first millennium BC, resurface on the site of the former American School in Saida. This archaeological site constantly evolving for 16 years has arisen “the only Phoenician priest statue discovered in Lebanon since the 1960s. There are only three other preserved at the National Museum of Beirut, from Sidon (Vintage Ford) Umm el-Amed and Tyre, “said Claude Doumit Serhal. To reflect this “exceptional discovery”, the head of the archaeological mission of the British Museum held a press conference on the site of the former American School, in Sidon, where a high place of funerary cult lasted from the end the fourth millennium to the medieval period. carved in stone “Ramla”, the Phoenician priest is backed by a long dorsal pillar.The left arm falls along his body. Clenched fist he holds a cylindrical object, a roll or a handkerchief. He wears a pleated kilt recalling the “chendjit” Egyptian, large central panel flanked by two “uraei” (cobras) with heads erect. The skirt and legs still retain traces of red paint. “There is no doubt that this unique piece will hold a central place in the future museum site whose construction, financed by the Kuwait Fund for Arab Economic Development, will begin this summer,” said Claude Doumit Serhal. Dated sixth century BC, the statue was discovered lying on her stomach on a marble floor covering a drainage channel from the Roman period (second century AD). Two rows of five holes etched into his back revealed that “it was also used to support a board game called Mancala, derived from the Arabic word naqala, meaning literally move,” said the archaeologist, thus referring to the explanations provided by Irving Finkel, an expert on ancient games in the British Museum. 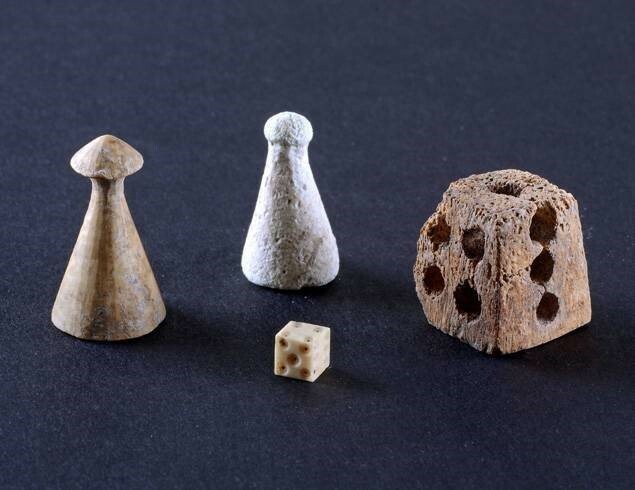 And indeed, a game of dice and pawns of various shapes have been identified during the excavations. The first millennium delivered as a head of Bes terracotta. This Egyptian god the unprepossessing appearance, which was supposed to drive away evil spirits and the evil eye, was adopted by the Phoenicians. Shown frontally, his grinning face is framed by two big ears and a lion’s mane. 156 burials excavated archaeological layers In the second millennium, archaeologists have unearthed twenty tombs and funerary jars pit built, bringing to 156 the number of burials excavated since 1998 … Around these tombs, where they held banquets honor of the dead, many objects were collected, including a scarab, an Egyptian jar Canaanite pottery, pliers or tweezers to embers, the terracotta statuette of a mother carrying her child and a seal engraved cylinder a scene depicting a human procession, in the characteristic style of Ebla. Interesting reference to Mancala origins.